Business environments and circumstances change quickly, both internally and externally. The internal changes impact the external and vice versa. What was true when we last assessed may not be true now. Assumptions that decisions were based on are discovered to be outdated or untrue. Current understanding of the business may not specific or measurable enough to be meaningful or actionable. We get so close to your business that we lose objectivity. Help us maintain a thorough and accurate understanding of condition of your business. Create the context for effective planning and performance management. Engage our management team and employees, enabling them to have a common understanding of the business, and to provide unified commitment to improving it and achieving success. Let’s start the most comprehensive assessment, Strengths, Weakness, Opportunities, and Threats Analysis. This is a very well-known process. There is a seemingly endless supply of information and templates easily available. If we are all set with this process, meaning we have a proven process that we execute regularly, then maybe this piece is just reassuring or affirming. Perhaps we have the assets and process but don’t execute effectively, regularly, or at all. Maybe this will inspire us to make it SOP. Or maybe this will inspire us to create and execute our own process regularly to give our teams and us the best chance to achieve success. Strengths and Weaknesses categorize the current state of the business and can include assets, capability, activities, offer(s), and achievement that currently exist. 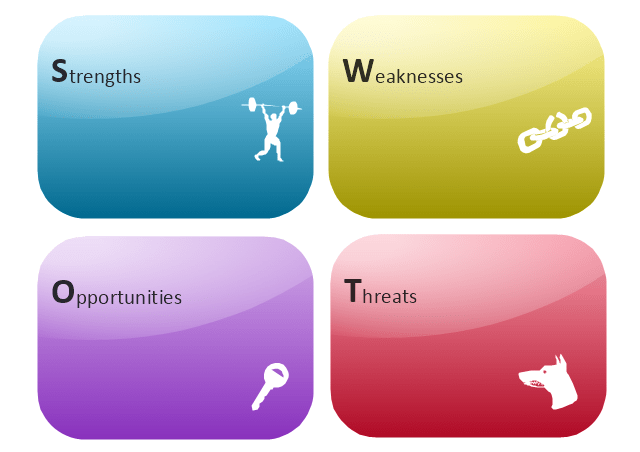 Strengths are generally productive and what make the company successful. Weaknesses generally counterproductive or destructive and obstruct or prevent success. Opportunities and Threats categorize a future state of the business and can include assets, capability, activities, offer, and achievement that perhaps exist potentially, but are not currently realized, but could in the future. Opportunities are situations that can be acted or capitalized on to achieve potential success. Threats are situations that are potentially destructive and can threaten viability. Here are some commonly used criteria to initiate new or fortify existing processes. We can use SWOT as part of a Competitive Analysis, too, by analyzing or assessing our competitors using the same process and criterion. We can verify what we know about them, what don’t know but want to and should know about them, and provide insight to direct effective positioning. So now there is one more piece about SWOT Analysis out there. It is my hope and intention this is the one that helps you and your team be more productive, profitable, and ultimately successful. I invite you to contact me with any feedback about this piece and SWOT analysis, and about exploring if and how I can help you achieve your success.